Young artist Hlynur Pálmason, who belongs to the younger generation of Icelandic filmmakers, revealed his writing-directing feature-length debut Winter Brothers. The film joins the tempting Icelandic arthouse queue of Heartstone, Sparrows and Rams, sharing general similarities, such as the role of nature in the narrative and as an environment, as well as a Nordic aura, while carving a path of its own. Pálmason started out as a visual artist before becoming a filmmaker. Winter Brothers does not attract the senses via a visual exhibitionism, a cliché expected from a filmmaker with a background in the arts. However the emerging Icelandic talent handles the narrative rather idiosyncratically. The center occupies a sibling duo, Emil and Johan, working in a remote Danish limestone factory. Johan falls into the category of the straight guy, the conventional one, while Emil is the odd one and the leading character despite the title promising a sort of on-screen equality. In one moment, Johan reprimands Emil for being too dark and thus contributing to his own ostracization from a tight-knit community of limestone workers. Emil is supposed to harness a darkness, literally brought up as the space where they all spend their working hours. 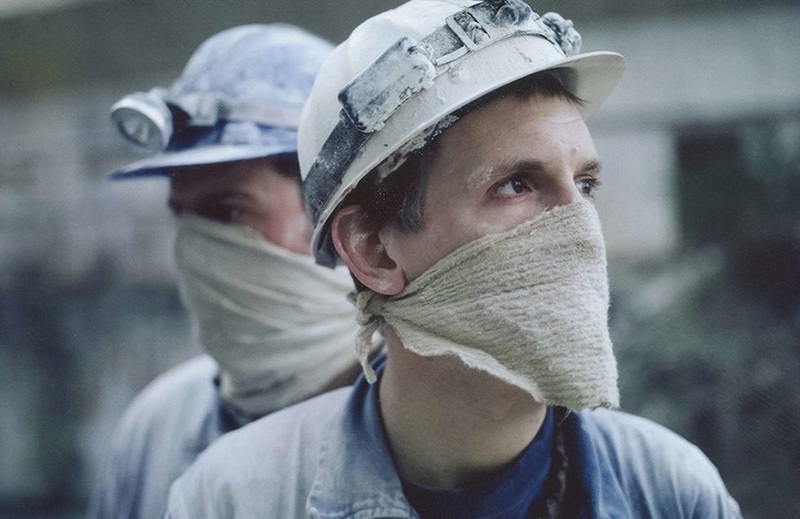 Winter Brothers follows Emil during a series of events and encounters resulting in an expulsion from the mining purgatory of the factory and community. The film reminds of the latest effort by Ronnie Trocker, The Eremites, with its mine setting, cold aesthetics, and isolated community, as if symbolizing a receding world, a world from the past century. And the harmony in the almost tribal community remains fragile, the clan-like allegiance proving to be the tipping point for Emil. He's a social misfit trying to fit in until his baggage of repressed violence systematically challenges his social conformity and compatibility. The character of the protagonist stands on the syndrome of arrested development, a man-child diagnosis that arguably stems from a dysfunctional parental relationship -- there is no mention of parents and Johan's social compatibility remains a cipher, unless psychological maturity counts -- and the lack of human affection; the mining staff is a tribe of sausages and everybody seems to be a part of a heteronormative club. It´s not a coincidence that Winter Brothers is billed as "a lack of love story". Emil tries to charm his way into a rather narrow social circle with a combination of homebrewed booze (referred to as “pussyjuice”) and magic tricks, which could not be a more juvenile attempt and a desperate cry for attention. The unhealthy doses of moonshine and pity serves as a social adhesive, functioning temporarily to Emil's benefit. Winter Brothers does not flaunt its visual sensibilities by virtue of the director's artistic background, though he has done some eye-catching land art. That labor is exemplary, carried out through the lenses of director of photography Maria von Hausswolff, shooting on 16mm, while oscillating on grey-blue palette dominated by white color -- the season is winter, the set is limestone mine, flashlights cut the thick darkness in tunnels -- invoking an antiquated manner of image, befitting of the environment of a lost world. The writer-director works with situations rather than a plot, crafting an expressive narrative distorted by hallucinatory and neurotic digressions as Emil slowly becomes more alienated and alienating. In one such bout of fantasy invading the harsh world of Winter Brothers, Emil unlocks the great mystery of mankind when he delivers the crucial demand of wanting to be “loved and fucked”, addressing precisely the primeval urge, maybe even being the tremendous enigma of the meaning of life, to fulfil the dualism of the human condition, psychological and physical, that wields damaging, even devastating, power over oneself. By focusing on situations and segments, Pálmason wipes away the concept of time in the story, contributing to its other-worldly constitution. Winter Brothers might fit into the New Greek Wave's Roy Andersson's oeuvre, if Andersson's father did not hug him enough as a child. Hlynur Pálmason's feature debut displays masculine pictures of the old world, a friction when gender and community conventions deviate as the film ponders on themes of isolation, alienation and almost masochistic resignation.